Technological improvements are utilized in data collection methods as in all areas of life. The expansion of computer and Internet use make it possible to conduct a survey on Internet. Today, many researchers take advantage of this opportunity. This paper seeks to answer whether there is any significant difference between data collection methods as Internet and face to face. To reach this objective response patterns from two data collection methods and from two different scales (Cetscale and Self-Efficacy) are investigated by using an entropy measure. Findings reveal that internet based survey provides less dispersed responses for selfefficacy scale in which social desirability effect is less than Cetscale. Furthermore our results provide evidence that scales have also influences over dispersion of responses. Aczel, J. D., & Daroczy, Z. (1975). On Measures of Information and Their Generalizations. Academic Press, New York. Bech, M., & Kristensen, M. B. (2009). Differential Response Rates in Postal and Web-Based Surveys among Older Respondents. Survey Research Methods, 3(1), 1-6. Bennink, M., Moors, G., & Gelissen, J. (2013). Exploring Response Differences between Face-to-Face Web Surveys: A Qualitative Comparative Analysis of the Dutch European Values Survey 2008. Field Methods, 25(4), 319–338. Beuckelaer A. D., & Lievens, F., (2009). Measurement Equivalence of Paper-and-Pencil and Internet Organisational Surveys: A Large Scale Examination in 16 Countries. Applied Psychology: An International Review, 58(2), 336-361. Chang, L., & Krosnick, J. A. (2009). National Surveys via RDD Telephone Interviewing versus the Internet: Comparing Sample Representativeness and Response Quality. The Public Opinion Quarterly, 73(4), 641-678. Couper, M. P., Kapteyn, A., Schonlau, M., & Winter, J. (2007). Noncoverage and Nonresponse in an Internet Survey. Social Science Research, 36(1), 131-148. Couper, M. P., & Miller, P. V. (2008). Web Survey Methods: Introduction. The Public Opinion Quarterly, 72(5), 831-835.
de Leeuw, E. & Mathijsse, S. M. (2016). Professional Respondents in Online Panels Threat or Blessing? Alert! Magazine, Feb 14, 2016 Q1. Erens, B., Burkill, S., Couper, M. P., Conrad, F., Clifton, S., Tanton, C., Phelps, A., Datta, J., Mercer, C. H., Sonnenberg, P., Prah, P., Mitchell, K. R., Wellings, K., Johnson, A. M., & Copas, A. J. (2014). Nonprobability Web Surveys to Measure Sexual Behaviors and Attitudes in the General Population: A Comparison with a Probability Sample Interview Survey. Journal of Medical Internet Research, 16(12), 1-14. Eroğlu, A. H., Sarı, S. (2011). Tüketici Etnosentrizmi ve Marka Bağlılığı Arasındaki İlişki. Uluslararası Alanya İşletme Fakültesi Dergisi, 3(2). 39-55. Frippiat, D., & Marquis, N. (2010). Web Surveys in the Social Sciences: An Overview. Population, 65(2), 285-311. Garrison, C. B, & Paulson, A. S. (1973). An Entropy Measure of the Geographic Concentration of Economic Activity. Economic Geograpy, 49(4), 319-324. Gözüm, S., Aksayan, S. (1999). Öz-Etkililik-Yeterlik Ölçeği'nin Türkçe Formunun Güvenilirlik ve Geçerliliği. Journal of Anatolia Nursing and Health Sciences, 2(1), 21-34. Gregori, A., & Baltar, F. (2013). ‘Ready To Complete the Survey on Facebook’: Web 2.0 as a Research Tool in Business Studies. International Journal of Market Research, 55(1), 131-148. Harrison, W., & Christie, R. (2004). Using the Internet as a Survey Medium: Lessons Learnt From a Mobility Survey of Young Drivers. Road Safety Research Policing and Education Conference, Perth, Australia. Homola, J., Jackson N., & Gill, J. (2016). A measure of survey mode differences. Electoral Studies, 44, 255-274. Ilieva, J., Baron, S., & Healey, N. M. (2002). Online Surveys in Marketing Research: Pros and Cons. International Journal of Market Research, 44(3), 361-376. Jaynes, E. T. (1957). Information Theory and Statistical Mechanics. Physical Review, 106(4), 620-630. Kaplowitz, M. D., Hadlock, T. D., & Levine, R. (2004). A Comparison of Web and Mail Survey Response Rates. The Public Opinion Quarterly, 68(1), 94-101. Kullback, S., & Leibler, R. A. (1951). On Information and Sufficiency. The Annals of Mathematical Statistics, 22(1), 79-86. Lewis, I., Watson, B., & White, K. M. (2009). Internet Versus Paper-and-Pencil Survey Methods in Psychological Experiments: Equivalence Testing of Participant Responses to Health-Related Messages. Australian Journal of Psychology, 61(2), 107-116. Mathai, A. M., & Rathie, P. N. (1975). Basic Concepts in Information Theory and Statistics. Wiley Eastern Ltd., New Delhi. McDonald, H., & Adam, S. (2003). A Comparison of Online and Postal Data Collection Methods in Marketing Research. Marketing Intelligence & Planning, 21(2), 85-95. Reza F. M. (1961). An Introduction to Information Theory. Dover Publications, Inc. New York. Shannon, C. E. (1948). A Mathematical Theory of Communication. The Bell System Technical Journal, 27, 379-423, 623-656. Shimp, T. A., & Sharma, S. (1987). Consumer Ethnocentrism: Construction and Validation of the CETSCALE. Journal of Marketing Research, 24(3), 280-289. Sonuga, J. O. (1972). Principle of Maximum Entropy in Hydrologic Frequency. Journal of Hydrology, 17(3), 177-191. Stanton, J. M. (1998). An Empirical Assessment of Data Collection Using the Internet. Personnel Psychology, 51(3), 709-725. Theil, H. (1967). Economics and Information Theory. North-Holland Publishing Company, Amsterdam. Van de Looij-Jansen, P. M., & de Wilde E.J. (2008).Comparison of Web-Based versus Paperand-Pencil Self-Administered Questionnaire: Effects on Health Indicators in Dutch Adolescents. Health Services Research, 43(5) Part 1, 1708-1721. Van Gelder, Marleen M. H. J., Bretveld, R. W., & Roeleveld, N. (2010). Web-based Questionnaires: The Future in Epidemiology? American Journal of Epidemiology, 172(11), 1292–1298. Wang, C-C., Liu, K-S., Cheng, C-L., & Cheng, Y-Y. (2013). Comparison of Web-Based Versus Paper-And-Pencil Administration of A Humor Survey. Computers in Human Behavior, 29(3), 1007-1011. Weigold, A., Weigold, I. K., & Russell, E. J. (2013). Examination of the Equivalence of SelfReport Survey-Based Paper-And-Pencil and Internet Data Collection Methods. Psychological Methods, 18(1), 53-70. Weigold, A., Weigold, I. K., Drakeford, N. M., Dykema, S. A., & Smith, C. A. (2016). Equivalence of Paper-And-Pencil and Computerized Self-Report Surveys in Older Adults. Computers in Human Behavior, 54, 407-413. Witte, J. C. (2009). Introduction to the Special Issue on Web Surveys. Sociological Methods & Research, 37(3), 283-290. ISNAD BARDAKCI, Ahmet , BALCE, Andım Oben , KANTAR, Murat , KALBURAN, Çetin , HAŞILOĞLU, Selçuk Burak . "Entropy Measure to Compare the Internet and Face to Face Surveys". 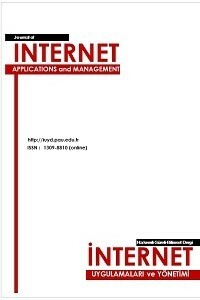 Journal of Internet Applications and Management 8 / 2 (December 2017): 31-44.